As you may have already discovered, the squat is at the top of the heap (along with deadlifts) as one of the most effective overall exercises for stimulating body composition changes (muscle gain and fat loss). This is because exercises like squats and deadlifts use more muscle groups under a heavy load than almost any other weight bearing exercises known to man. 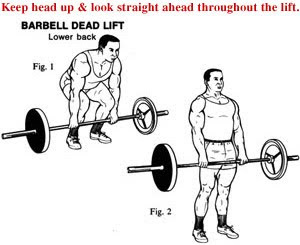 Squats and deadlifts use hundreds of muscles throughout your entire body to move the load and also to stabilize your body while doing the drill. Hence, these exercises stimulate the greatest hormonal responses (growth hormone, testosterone, etc.) of all exercises. If you don’t believe me that squats and deadlifts are THE basis for a lean and powerful body, then go ahead and join all of the other overweight people pumping away mindlessly for hours on boring cardio equipment. 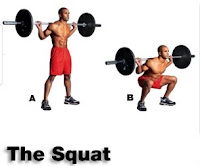 Squats can be done with barbells, dumbbells, kettlebells, or even just body weight. Squats should only be done with free weights – NEVER with a Smith machine! My program, The Truth About Six Pack Abs contains the full story on why machines are so inferior and even potentially DANGEROUS compared to free weights. This is why these exercises (along with other primal movements, including rows, chinups, upper body pressing, and lunging) are always included in my programs to some extent. If you are following a program that does not include these exercises, or if you are training primarily using machines, I would seriously consider changing your routine! I will be making my two most effective programs available this year. I'll post when they are ready to download.